Location: Merrion Sq. & Fitzwilliam Sq. 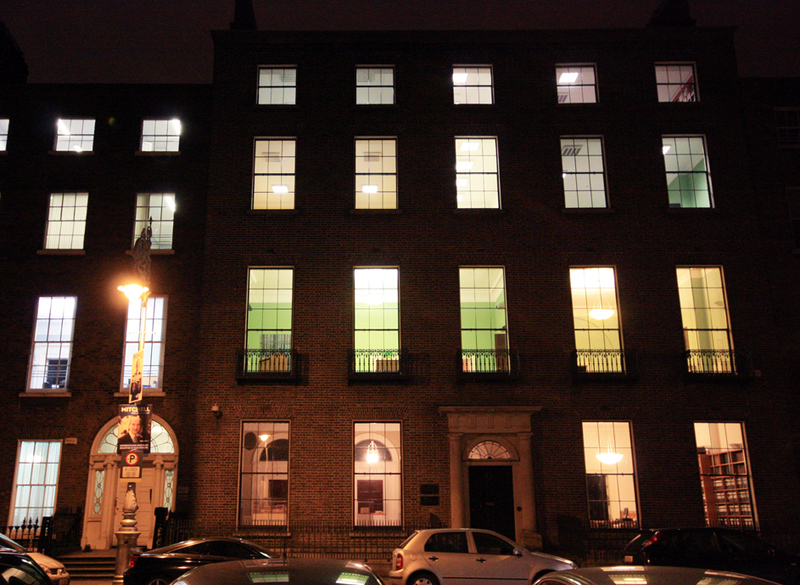 The Dead City invites you to a public light performance: At exactly 8.00pm the properties facing onto Merrion Square and Fitzwilliam Square will turn on their lights for exactly one hour. A celebration of our Georgian heritage and a transitory illumination of our potential urban future. Number Twenty-Nine, the Georgian House Museum, Fitzwilliam Street Lower, will be open for viewing. In an event titled “The Dead City”, the authors of REDRAWING DUBLIN participated in Dublin Contemporary in 2011. 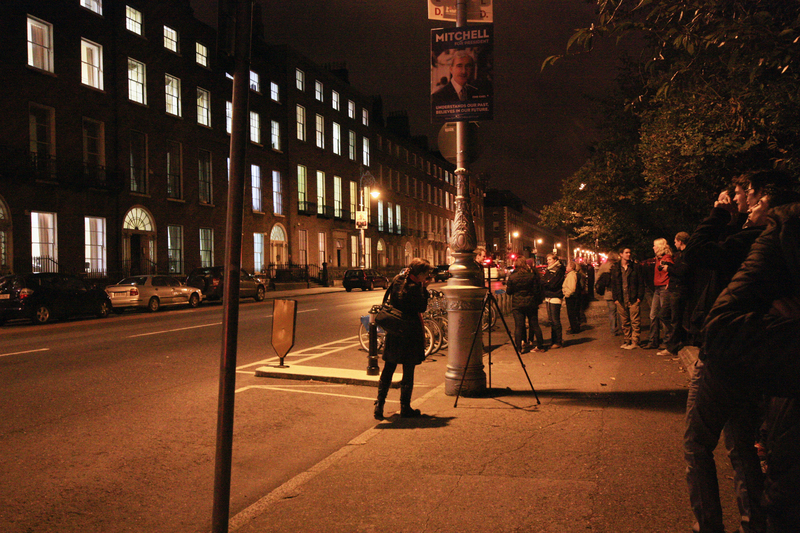 We ‘invited’ the properties owners, tenants and residents on both Merrion and Fitzwilliam Square on the evening of Saturday 8th of October to simultaneously turn on the lights of their property at exactly 8pm for one hour before turning them off again at 9pm. city, yet this is also an oddly underperforming urban asset. Very few people choose to live here . In what other European Capital City would a street like Mount Street Upper (vista terminated by the Pepper Canister Church) not be one of the most desirable and sought after fashionable streets on which to live? In ‘turning on the lights’ the “Dead City” sought to temporally and metaphorically breathe life back into the Georgian City, to recapture and re-imagine the glory of past light-filled residential squares. The “Dead City” was billed, perhaps with an exaggerated sense of theatrical flourish, as “ultimately a grand urban performance, the public street not the piano nobile becoming the viewing space. The temporary illumination inviting the citizen – standing on the street outside – to look though the window, simultaneously looking inside but looking back in time in admiration of the ambition of Georgian urbanism” . The lights indeed did come on, admittedly not in every building or along every street. We greatly appreciated those who did contribute. Many of those working in the buildings, although intrigued and supportive didn’t participate for the very simply reason that they lived too far away. 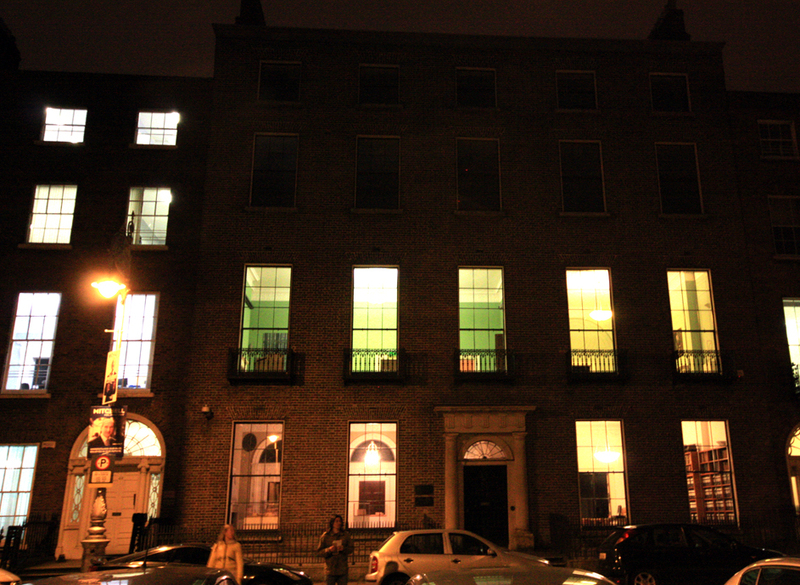 Travelling back to Fitzwilliam Square to from Kildare or Balbriggan to turn on the lights was a ‘big ask’. Sprawl worked against us. We note the irony. In many ways, this is just the beginning of a bigger conversation about the future of the South Georgian core and an opportunity to further engage with an altogether more intriguing and related question. Why do the affluent of Dublin City – apart from a few household names – unlike their counterparts in Paris, New York and London choose not to live in the most beautiful and central part of their city? And how can Dublin attract middle and higher income people back into the heart of their city to live, to sustain local business, to generate vitality on the streets in the evening, but most importantly, to promote the status of urban living that is essential for the future sustainability of Dublin? REDRAWING DUBLIN has written extensively on the challenges and opportunities of how to sustain city living in Dublin’s Inner City. Successful residential urbanism is not the mysterious subject it is often presented to be. Until the inner city offers a meaningful supply of spacious well-designed affordable high density homes, quality public schools, safe local parks, clean, green and traffic managed streets, an extensive quality everyday Dublin urbanism is unlikely to emerge. But the urban residential challenges of the South Georgian Core are surely different? What explains the reluctance of the Dublin elite, the trendsetters, to choose the pleasures of an urban life on Fitzwilliam Square over life in suburban Foxrock or Dalkey? Before endeavouring to answer that question, it is worth refreshing ourselves of the ambition and imagination of the Georgian urbanists. the delight of urban voyeurism in favour of the hidden domestic defensiveness of the Victorian and suburban garden. With their desire for high-density living, delightful volumes, spacious dimensions, new technologies, and an eager embrace of relatively tall, mass residential housing, one can only imagine what the Georgian architects and engineers might be building today. So what are the challenges or barriers to attracting higher income Dubliners back to Georgian Dublin? Perhaps the reasons are no less prosaic than how to sustain quality city living in Dublin’s inner city. Is it traffic and parking or the challenges of anti-social behaviour? Certainly the semi-permanent parking of a minor fleet of Double Decker buses with engines running on the South side of Merrion Square doesn’t instil confidence of the civic ‘management’ of public space. Perhaps it’s the quality of local schools? Yet some of the best schools in the State are located St Stephens Green. Is it the lack of a suitable sized garden that isn’t overlooked? It has been suggested by some that the houses are “simply too big”. Perhaps the city, Dublin’ city centre is simply not interesting or big enough to sustain a 24-7 interest in urban living? Perhaps it’s something altogether more esoteric but none the less compelling – ‘taste’ and ‘status’ – where do my peers choose to live? Which comes first for suburban middle class Dubliners, the perceived or real lack of urban choice or the decision not to choose urban? Whatever the reasons, they are worth discussing. This is not simply an intriguing deconstruction of the mind of middle class suburban Dublin. There are both significant opportunities and economic challenges facing the South Georgian Core. 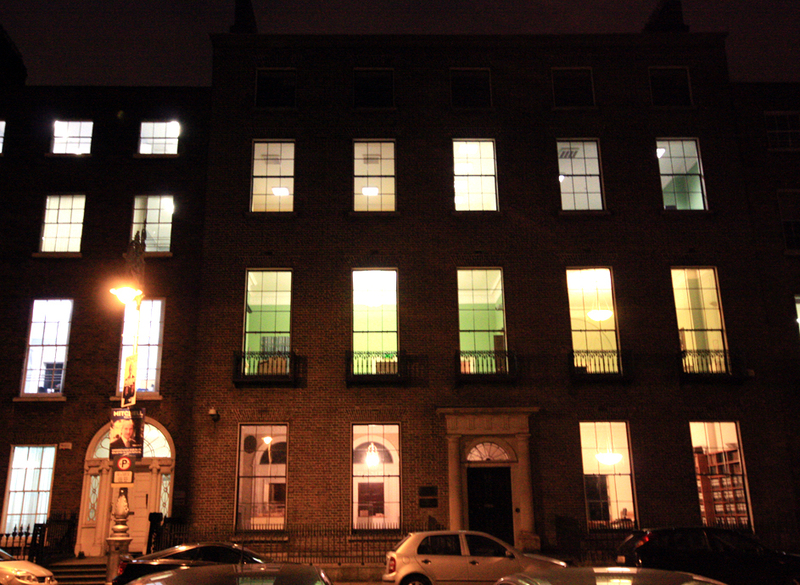 Currently up to one in five properties in Merrion and Fitzwilliam Square have a For Sale or To Let sign”. Anecdotal evidence suggests Georgian Dublin is becoming increasingly unattractive for the office market as businesses move to more convenient purpose built office blocks on the M50 or to the Docklands. The authors of REDRAWING DUBLIN have argued that attracting middle-income earners to live in the heart of the city should be a policy priority for Dublin. We would further argue that Dublin City Council needs to set out a strategic vision for the long term sustainable future of the South Georgian core, and that this vision should be to repopulate the area as a desirable place to live. The merits of that vision are many, overlapping and reinforcing. Despite a doubling of its population in the last 15 years, the inner city continues to remain the home of extensive pockets of dereliction and underperforming urbanism. Attracting middle-income families back into the heart of the city would assist in consolidating, often fragile, residential living elsewhere in the city centre and inner city. A residential vision would give significant practical support in advancing the UNESCO application for world heritage status. An interesting comparison is the city of Tel Aviv. The city was designated a World Heritage City in 2003 on account of its unique Bauhaus and International Style architectural legacy. Interestingly a significant proportion of the city’s population resides in purpose-built Bauhaus apartments, a fact that gives real meaning and credibility to the city’s urban identity and critically was an important factor the decision to grant the city its UNESCO status. UNESCO status underpinned by a residential vision provides a significant opportunity to ‘branding the City’. 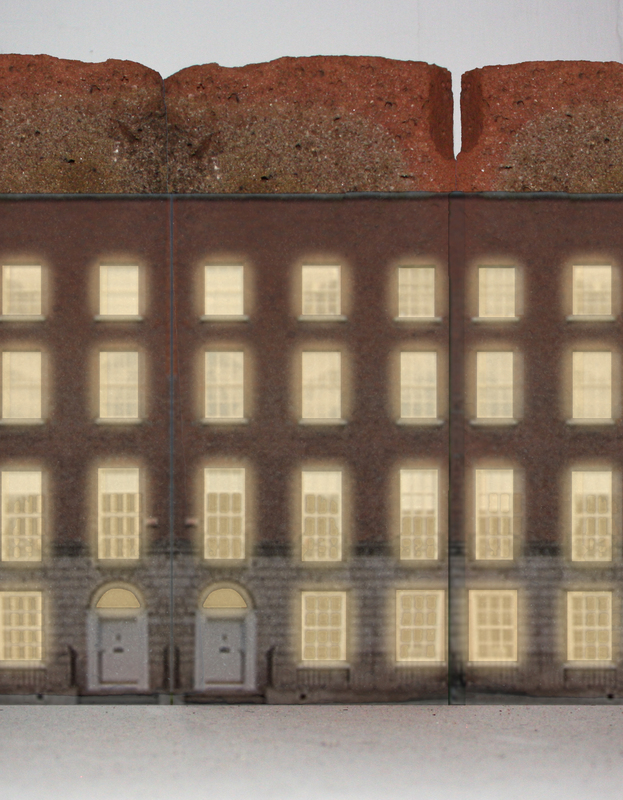 Dublin’s Georgian ‘redbricks’ along Upper Mount Street may, in time, become the fashionable equivalent of the ‘brownstones’ New York. Residential consolidation has the potential to unify wider Dublin civic society around a shared vision for a collective Dublin regeneration project, to enthuse Dubliner ‘ownership’ of the city’s Georgian heritage. A residential vision should not favour or preclude specific models of residential ownership but instead be driven by the primary desire to provide demonstration models for quality urban living. Perhaps for too long The City has not fully acknowledged or successfully challenged a lingering widespread Dubliner perception that inner urban Georgian living is either the preserve of the eccentric or the fate of the destitute and impoverished (student bed-sits). The residential revitalisation of the South Georgian core may over time permeate to more challenging areas of the inner city, providing an economic rationale for investment to consolidate and reuse vulnerable historic fabric in places like Thomas Street and the North inner city. A final thought. Do the preferences of the rich drive local urban culture or does the local urban culture drive the preference of the rich? If it is the former, how do you influence the preferences of the rich to deliver a successful city? And should urban regeneration not also focus on the rich? Achieving sustainable mixed income areas are after all an important goal in any successful urban regeneration. The 2006 Census tells us that a mere 388 people live in private households in the South Georgian core (Ward of Mansion House B) with just 217 persons living in homes built prior to 1919. (Census 2006, Theme 1:1 population, and Theme 6:2(a) – Number of private household by year built). Dead City Open House October 2011. During the property boom “the largest and best preserved Georgians often made up to €1,200 @ sqft (€12,916 @ sqm) working out at between 3.5 million and 5 million euro per house – depending on size, condition, and availability of car parking at the rear, In recent months most of the period houses going for sale have been priced between 1 million and 2 million euro depending on condition and whether a mews house is included”. Irish Times 15 June 2011. The article was published in Architecture Ireland Magazine January 2012. 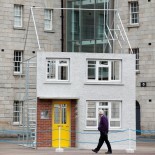 This entry was posted on October 13, 2011 by Redrawing Project in Articles, Events, Exhibitions and tagged Dublin Contemporary, Dublin Contemporary 2012.